1,915 cards mailed between August 24 - 30!! Total number of cards sent: 182,257!! Following are a collection of poems and sentiments that were added on the discussion board on the old CFH website; please add your own in the comments on this post! This card carries our prayers. May God watch over you! Far from loved ones and home. With the courage to do what you do. And to build a better world. The way you protect others. Destined to be our hero. God & I thought about you today. is Fear that has said it prayers. Be safe and come home soon. Not many people know this, but....it's almost a birthday for this little band of happy cardmakers!!! So we "incorporated" officially last September. (That's a state recognition of us as an official entity; we're still waiting the IRS to provide our 501(c)(3) designation when they get around to processing us.) So do you know what that means? We have a BIRTHDAY coming up!!! And what birthday doesn't have a PARTY to go with it? So mark your calendars.....it's going to be a couple days worth of FUN! Because something like this deserves so much more than one day! We're going to start celebrating on 9/11 with a beautiful tribute to our heroes, who inspire us every day. We invite you all to post on your blogs, your facebook pages, your twitter feeds, and anywhere else you're able. Tell the world how much it means to you to be defended by such honorable men and women! We'll provide some videos you can share, avatars you can change to for the day, and of course we'll produce our very own tribute too. And on our actual birthday, 9/12, we'll be having a party right here on our site. We're working on some special HUGE surprises....and our HEROES have been working on some treats for you all too!!! Yes, I said our HEROES are sending presents for YOU! You are going to be SO excited! I can't believe what they're sending in. It's taking everything in me to hold back til party day!!!! You'll all want to come to our homepage and check it all out...did I say yet that I can't WAIT!??! So polish up your party shoes, iron your best party dress, and get ready to join in the shindig!!! If you want to host your own celebration — virtual or real-life — post your ideas in a comment here. You can offer blog candy, have friends over to make cards for the day, sit down with your family and write AnyHero letters..whatever suits YOUR way to celebrate! We'll link to as many as we can when the party starts! Thankful Thursday Aug 27: 3224 cards! Many thanks to all our donors this week! Ken D., and Denise H., Souderton, PA - How thrilled our heroes will feel to be able to send a card from another hero - a WWII Veteran! Thank you for taking the time to make these wonderful cards for our service people! Laurie J., Houston, TX - Each one of your boxes is bursting with love, thank you so much! Robin & Stephanie G., New York, NY - What a great box of fall and winter holiday cards, these will sure be great for our heroes! Elizabeth S., New Canaan, CT - What a wonderfully FRIGHTFUL box of Halloween cards - they are just darling - thank you for sharing them! Randa M., Columbia, SC - Thank you so much for your generosity for our heroes - your cards are just wonderful! The decorated envelopes are a great touch also! Marie C, thank you so much for your generous shipping donation!!! Jennifer H, Dallas TX - thank you so much for the beautiful envelope of cards---and for sponsoring a box!! Hooah! Deloris T, West Salem OH, what sweet cards, these will each be treasured. Thanks for the shipping help too!!! Lisa S, Jacksonville FL......what a great package of cards!! THANK YOU! Betty T, Salina KS......another package of beautiful cards! Thanks so much for your continued support! Lee B, Dalton WI.....thank you so much for the gorgeous cards!!! Jeannine K, Tampa FL.....your cards are BEAUTIFUL!! Thank you for the wonderful box! Marly M and Kay B, Fox Lake WI......thank you ladies for the wonderful box of cards!!! University of MN Youth Programs - wowsers, kids! Thanks so much for the awesome AnyHero letters...you're going to make someone smile HUGE!!! Vicky L, Cullowhee NC, your cards are so darling - and that is the cutest presentation of a donation I've ever seen! *wink* Thanks for the AnyHero pack of cards, and the one for Ben! Chris C, Chicago IL, bless you for your generosity! Wow!! Anne M, Kihei HI, thank you for these great cards and cardfronts, wow! And the generous donation is much appreciated! Chris C, Parkland WA, your cards are so sweet...God bless you! Thanks for the shipping help too! Mali and the SF East Bay Scrapbookers - what a huge beautiful box full of cards....and all the AnyHero letters: thank you!!! Patti S, St Louis MO, thanks for another package of wonderful cards! Denise W, Las Vegas NV, thank you so much for your faithful generosity! Traci and Scrapbooks and Etc, Harrisburg NC - WOW! Two boxes of such gorgeous cards, THANK YOU! And what a generous shipping donation...you're all wonderful!! Johanna M, Calabasas CA, beauuuuuutiful cards, our heroes will love them all! Thanks so much for your shipping donation, too, you're a blessing! Fiona and friends! All of you made the most WONDERFUL AnyHero cards and letters! I'm so impressed and our heroes will be too!! Jessica T, Sterling VA, thank you so much for your shipping donation - and for raising a daughter like yours with a heart for our heroes!! Seongsook D, Elk Grove CA, thanks so much for your cards - and wow on getting your friends to join in too! Awesome! Jennifer B, Sacramento CA, such pretty pretty cards, thank you so very much!! Seongsook's cardmaking friends, CA - thanks so much - and please tell that wonderful 5th grader a big thank you too! Melissa W, A Scrappin Affair, Mesa AZ - thank you soooooo much! They're adorable...and the AnyHero cards will really bless hearts. You're awesome!! Mary C, Copperas Cove TX......thanks so much for the great box of cards. They are beautiful! Mary S, Taunton MN.....Thank you so much for the wonderful cards! Love them!! Lisa R, Lexington TN.....thank you for the beautiful cards! 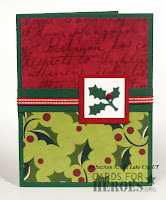 Carol G, Dorchester WI.......what an awesome box of cards! Thank you so much...they are beautiful! Dee N, Duluth MN......Wow! Your cards are awesome.....love your style! This post should probably be titled: "Facebook: The Addiction." I had been searching for where most of you "hang out" - and Facebook seems to be the prime target for the largest percentage of our CFH family! Now, I know I'm supposed to want you all to have as much cardmaking time as possible, right? Not wooing you into Facebook! But our fan page is so much fun it's hard not to invite you to come join in the fun. So if you haven't signed up yet, here's a few thoughts. First, you don't have to join to view our fan page and its contents. I think you do have to have an account to comment, but you can check it out and see what we're all up to over there. There's nothing you "have" to do once you sign up. Sure, the site will try to get you to connect with people and that sort of thing, but do it at your own pace. You don't need to friend someone just because they sent you a friend request, and you don't have to post anything even if your friends bug you about it. It *is* addictive if you let it be! I had to give up on the games, virtual gifts and farms, etc, in order to keep my time limited to what's important to me. So, if you want to sign up, great, and if not, that's just dandy too! And if you want to know what kind of thing is going on over on the fan page, you can check it out without signing up for an account anytime - http://facebook.com/cardsforheroes - there are a couple of these casual videos posted like the one below over there. These aren't going to go into YouTube because they're way too low-production for the whole world to see, LOL! Sorry about the tiny size of this - yikes! It's a little bigger on Facebook, so you migh try going to see it over there. 4426 cards mailed between August 17 - 23!! I am from Korea three years ago. I live with my husband in Elk Grove, California. He is my best friend who is very patient and supportive. I work for the State of California. I lead Card Making 101 class every Thursday during lunch time for my card making friends at work. They started card making because of me and now they are so excited about it. 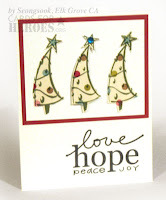 They are happy to make cards for CFH, too. I have been making cards over two years. I started making cards for my family and friends on their birthdays or special occasions. When I took scrapbooking classes, I fell in love with patterned papers and I wanted make smaller version of scrapbooking pages on my card. They loved it and that made me keep making cards. I have been making cards for our heroes since January this year. I learned about Cards for Heroes through the Card Maker card swap. One time it was a CFH Card Drive not a card swap. I visited the CFH website and I was so touched while I was reading more about CFH. What's your favorite kind of card to make? For my family and friends, I make Birthday cards and Thank You cards. 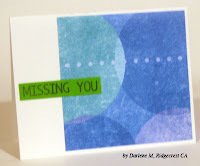 For CFH, I make a lot of Thinking of You, Missing You, Love, and Holiday cards. I am going to try to make waterfall cards with all these thems. It will be a lot of fun to make and would give a joy to the receiver. I love to work with patterned papers combining stamp and embellishment. I like to use all kinds of tools that I have as much as I can. I like cutting details, embossing, punching, and coloring with water brush. I like to add dimension on my card with brads, ribbon or rhinestones. Colors, style, or product that draw you? I thank our heroes. I am grateful for my safe life because of their serving this country. I really appreciate the idea of Cards for Heroes. It inspires me and encourages me to make more cards. Whats a "card hospital"? It's the cards that our shippers set aside for a time, cards that need a little extra help. Dark cards needing liners, embellishments falling off, really odd sizes that we have to scramble to find an envelope for. And the poor hospital beds get full! As we get into the holiday season, we want to try to get the cards processed and packed quickly, and eliminate stayovers in the hospital! Last year we processed and mailed 35,000 cards in the 3month holiday window---and this year will be even more. So the more you can "help a sistah out," the faster we can get your beautiful creations out to our heroes! Are you sure I can't use Glitter? Many of you have seen our requests not to send glitter cards. It's especially hard during the holidays, we know, and it's a temptation we need you to resist! A little glitter (some stickles in the star on a tree, or some Spica pen on a gift box) is ok, but we really mean a little! If it rubs off on your hand, don't send it please! It takes us time to sort those out. Can I use dark cardstock? Yes! But if you can't see bic pen written on the cardstock, please please please put a liner in the card. Otherwise our shippers have to sit and do that. How about handmade envelopes? We're receiving more and more of these. (Is this a trend? Cool!) And while they're okay as long as they'll last in the mail (if they're from thin magazine stock, please be careful, we don't want our heroes letters to be shredded and not make it home to their families!! ), we're getting a LOT that have no adhesive to seal them with. Please take care of that on your end, we just don't have the time. What about envelopes in general? Edited July 2010: We now purchase envelopes - by the thousands! We appreciate your donations toward that; but for our shippers, the time factor of tucking is the 'expensive' part. We're happy to do it, but are also thrilled with those sending in stamped tucked cards! 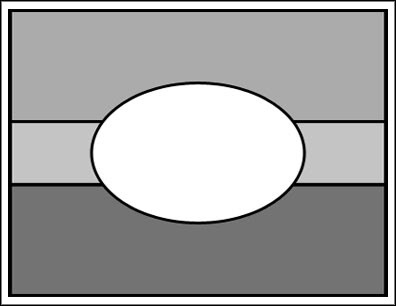 What kind of special packaging can I use? Keep it minimal! Plastic sleeves have to be removed, so if shippers need to take them each out of a sleeve, that's a lot of time. Why the A2 card size request? We've emphasized A2 cards or smaller because they're best to get the most cards in a box for our heroes. When we receive larger ones (envelopes any bigger than 4.5 x 5.75), they each take up the space of two cards when we line up rows - and that's just not too efficient when we want to get as many in a box as we can. So if you're able to keep to A2 cards, that really really does help. Note: Square envelopes are quite expensive, so if you send squares, please provide envelopes, thanks! Does my $1 donation really help? Absolutely! Even a dollar makes a difference, when we all pool our resources together. We treasure each of you who are able to help out! Those who can give more, we appreciate you so much! Do I have to stamp the cardbacks? If you have a CFH stamp and can stamp them, please do! Some folks use labels or handwrite the url - those are great options too. We love to hear from families who visit after receiving a card from their hero. If you don't have a stamp and plan to order one, please email info@cardsforheroes.org. Thanks! Should I pack each card with its envelope, or separate? If your card is stamped on the back, tucking the back of the card inside the envelope is helpful. If not, we need to take it out of its envelope anyway, so a stack of cards separate from a stack of envelopes is just fine. Do I have to include the packing slip? That slip itself isnt necessary, but the info on it is! Please provide your contact info and the quantity of cards inside the box; counting them slows down processing, so if you've assessed what's in there first, it makes our job go more quickly. The slip also helps us when doing data entry to track your cards, so we appreciate when you include it. So there you have it, 10 tips to help out.....and what's so amazing is the wonderful folks who have been asking these things because you wanted to make life easier for our shippers! You're awesome!!! We truly appreciate all the efforts you all go to for our heroes...thank you all!!! Thankful Thursday Aug 20: 4743 cards! Many thanks to all our fantastic cardmakers who sent in creations this week! Joanne B., Lewiston, ME - Thank you for the wonderful cards, the Thanksgiving cards are really lovely! Therese D., Lewiston, ME - Thank you for coordinating yet another great box from our Maine friends! Awesome job! Lauren B., Lewiston, ME - Thanks for creating such wonderful cards to send to our heroes - they will appreciate them so much! Wendy S., Raleigh, NC - What a wonderful assortment of cards in your box - perfect for now and later! Great job! Pamela L., Mineral Bluff, GA - Terrific cards, thank you for sharing them with our heroes! 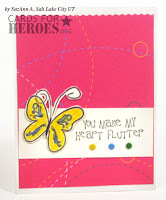 Nancy F., Trexlertown, PA - Thank you for organizing a cardmaking day - glad you had fun and our heroes will love your result!! Joanne M., Allentown, PA - Thanks for joining with Nancy and making some great cards for our heroes - glad to hear you had fun along the way too! Claudette A., Auburn, ME - Great cards in the Maine package today, thank you for sharing your talent! Kate M, Bossier City LA, your cards are so pretty - and it's AWEsome to see that dahlia card in person! Thanks so much for the donation as well..you rock! Connie T, San Antonio TX.....thank you for the lovely cards! Tammy F, Nort Judson IN......WOW! Your box is impressive. Cards are beautiful and quantify is great! Thanks! Sara G and friends, San Antonio TX......Ladies thank you so much for the beautiful cards! Leah C, St Paul MN.....These Christmas cards are stunning!! Thanks! Marilyn and Betty S, Columbus OH......Ladies, another great package of cards. THANKS! Ann R., Palmyra, NJ - 25+2 and a bonus card, great job on these wonderful cards! Thanks for the shipping donation also! Tammy H, Harrisburg PA.....what a wonderful assortment of BEAUTIFUL cards! THANKS! Susan S, Castle Rock CO......thank you for the wonderful cards!! Love them! Sue A, Rockford IL......what a wonderful package of Christmas cards! They are stunning! Janine D, Wind Lake WI......WOW! What an impressive box of cards. They are stunning!!! THANKS! Cherrie M, Camarillo CA, thanks sooooo much for the huge box of cards! Chris P and the wonderful folks at Deloitte - oh my what a fantastic package of AnyHero letters!! Thank you on behalf of all the hearts that will be overrun with joy! 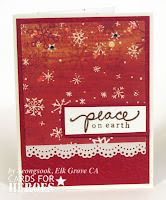 Seongsook D, Elk Grove CA, you outdid yourself, these Christmas cards are just stunning! Thank you! 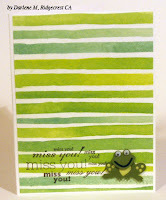 Marian N., Conyers, GA - What a great package of cards - your use of layering is just beautiful! Thanks for your first donation to CFH! Becky M., Ellicott City, MD - Thank you so much for your Christmas in July donation - awesome job! Jody M., Scottsdale, AZ - Thank you for yet another wonderful box of cards, and a generous shipping donation - you are awesome! Krystal H, thank you for your generous donation!! Rebecca P. and Daughter, Virginia Beach, VA - Thank you so much for another great box of cards (the fall cards are wonderful!) - and to your daughter for her shipping donation - awesome job! Kathy R., Duncan, SC - Amazing box loaded with cards both for the holidays and everyday - thank you for thinking of our heroes! Paula S., Stamford, CT - Way to use up that stash doing something good for our heroes! Thank you for your ongoing support! Buffy F, San Francisco, what awesome cards!! Thank you so much...our heroes will absolutely love using them! Denise W, Las Vegas NV - such a pretty box full of love, thank you!! Tami W, Walnut Creek - beauuuuuuutiful cards, they arrived so perfectly! Thank you so much for blessing our heroes with your talents! Cheryl Y, South Pasadena CA, absolutely love all the cards in BOTH packages, wow! Your generous shipping donation is so appreciated, thanks!! 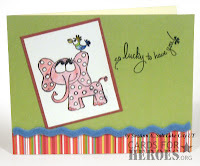 Vickiy O, Las Vegas NV, your cards and AnyHero are all fantastic, thank you so very very much! Kimberley M, Kennewick WA - what a GREAT idea to make cards in honor of your Mom's birthday! Happy bday Mom!!! Cassady, Camino CA - thank you SO much for all these pretty cards!! Greta P, Milford OH, your cards arrived right on time, thanks for the great selection! 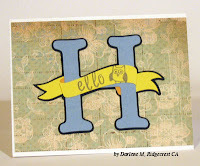 Lee B, Dalton WI, your cards are so cute - and all that work on the handmade envelopes, wow! Thank you!!! Julie W, Greenfield WI......WOW, what a box of cards! They are BEAUTIFUL! JoAnne N, Romeoville IL.....thank you so much for the wonderful cards!!! Susan S, Grove City OH.....thank you for another great box of cards. BEAUTIFUL!! Thanks you also for the Any Hero notes. Helen M, Spring Creek NV.....thank you for the great box of cards and Any Hero letters!! Sue A and Karen N, Rockford IL.....thank you for the stunning cards! WOW! Karen P, Chicago IL.....your cards are beautiful! THANK YOU for them and the Any Hero letters. Shirley V, Rochester MN.....thank you for the wonderful cards!!! Love them. Lorraine D, Norwood PA.....Thank you for the cards. I needed cards for kids! Jody M, Scottsdale AZ.....what wonderful cards!!! Thanks for them and the Any Hero letters! To our anonymous donor in Collinsville AL, thank you SO much!! Nancy C, Hollister CA, your cards are always so darned cute - love all the embellies and papers! Gayle & Tori G., Middletown, NY - Thank you for the awesome package of cards, and shipping funds too! Cara S., Phoenix, AZ - Great box of cards, thank you so much for sharing them with our heroes! Joyce L., Flushing, NY - Another great box of cards, your creativity is wonderful! Judy A of Upland, CA!!!!! Now, Judy hasn't supplied us with an email address, but she's in our system...so her box of goodies goes out in tomorrow's mail! Congratulations, Judy!!! The REAL big winners are our heroes, of course - 1,111 of the cards sent in this summer have been for CHRISTMAS! Thanks everyone for helping our shippers get a jump on things!! Keep on rockin' the creativity everyone!!! New card book + CFH! Kimber McGray - scrapper, author, military wife, and CFH supporter - is writing a new BOOK! And guess what? She's going to send all the card submissions to us for our heroes!!!!! 3703 cards mailed between Aug 10 - 16! How long have you been making cards? 10 years. I started making birthday cards for my mom to send to family members. How long making them for our heroes? Over a year, I think. Could be longer. How did you hear about CFH? I was looking for a swap to join on one of the message boards and ran across another post about CFH. What’s your favorite kind of card to make? All kinds. I like to try different techniques at least once. Do you have a special technique you love to use? Not really. Making cards is a great opportunity to make use of my scraps. Are there colors, style, or product that draw you? I like bright colors, bling, and different effects. What motivates you to make cards for heroes? I wanted to do something for our soldiers. It's a win, win for us papercrafters. For me, I get to enjoy my hobby as well as give something to our soldiers to show my appreciation. CFH is a great motivator. Happy Holidays for Heroes - MiniBloghop! Welcome to the final stop on the bloghop!! Here's a little early Christmas present for you...a video with the bloghop cards! (At least all the ones posted by Friday night!) They've also all been added to our card gallery — so they're collected for your viewing pleasure and inspiration as we all get busy making holiday cards! These cards are made with a great new stack — fantastic papers by K & Co! One card has the papers layered with black, and the other sports a ribbon with buttons glued along it. It's really a versatile sketch - post a link here if you try it out! Now that you're inspired, we have one more thing to do - check out the blog post here, and sign up for your state to send a card for Ben!!! Then go get busy crafting now that you're inspired! Thankful Thursday Aug 13: 7363 cards! 7363 cards received in the last seven days, WOW! Connie J, Littleton CO - oh my what a lovely box of cards, they're going to bring so many smiles! Thank you! The Ellicott City Rubber Stampers, Ellicott City, MD - Thank you for another batch of wonderful cards, your work is always so wonderful! Cathy C., Winston-Salem, NC - On a hot summer day, your Christmas cards were a beautiful blessing, thank you so much for sharing them with our heroes! Marianne C, Naches WA, bless you, what a fantastic package of cards---each will be so loved! Your shipping donation is so appreciated too! Nancy H, Knights Landing CA, what a beautiful collection of cards! Thank you sooooooo much!! Cindy W. and the Randolph High School Golf Booster Club, Randolph, NJ - Thank you for the wonderful box loaded with cards, this will help fill another box this week! 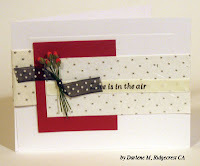 Darlene McG, Ridgecrest CA, your cards are so simple and ADORABLE! Thank you so much, what a blessing! Diane B, and everyone who took part in Letters Home...can I just say the biggest WOW ever? That box of 900+ cards was AMAZING! Many are in the mail already!!!! Heather B, El Cajon CA, your cards are so cute! Thanks soooo much! 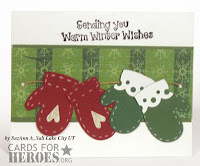 Julie R, Greenacres FL, your cards are so pretty, our heroes are going to love them - can't wait to start Christmas shipping! Thanks for the postage help! Kathie H, Victorville CA, thanks so much for the awesome cards!! Linda H, Circle Pines MN - Ho Ho Holy Holidays, what a beautiful box of holiday cards, Linda, thank you!! Your donation is much appreciated as well, bless you! Linda H, Marietta GA, thank you so much for your 25+2 challenge cards! You're very talented, these are beautiful! Sharon P, Victorville CA - your cards are just adorable! So glad you stumbled onto our website...thanks for the shipping donation and ALL the AnyHero letters too! Denise W, Las Vegas NV, thank you for your weekly faithfulness, wow! Jennifer C, Stone Mountain GA, thank you so much for the great cards - and custom envelopes to go with them! So beautiful! Lyn B. and The Paper Arts Club of CNY, Brewerton, NY - Thank YOU for joining our worthy effort - your cards are wonderful! Mandy A. and Mimi D., Pembroke, MA - Thank you for your wonderful package of cards, and for helping us set up a box at your local store for card collection - awesome! Marian P., Wappingers Falls, NY - Wonderful package of cards, and a nice shipping donation too - thank you so much! Nancy M, Fremont CA, I love your cards---especially the "I wish I was....(inside) Home for the Holidays"...that one is going to be fought over by our heroes. Thank you! Tina H, Northridge CA - your cards are so cute, thank you sooooo much!! 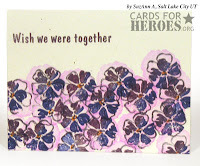 Carol P, Peoria AZ, I just love these cards, and our heroes will too! Thanks so much for the shipping help and AnyHero letters too! Janine C, El Monte CA - your cards are always so pretty - thank you for faithfully serving those who serve us!!! Kathay P, Humble TX, your generosity is soooo appreciated, thank you! SuzAnn A, Salt Lake City UT, thanks sooooo much, your cards are fantastic! Suzanne S, Irvine CA, your cards are precious! Our heroes are going to love them all! Becky D, Warwick RI.....thank you for the beautiful cards. 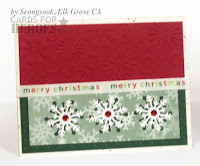 Seongsook D, Elk Grove CA......your cards are beautiful as always. THANK YOU! Mary S, Taunton MI.....a wonderful box of cards!!! THANK YOU! Polly P, St Paul MN...Thank you for the wonderful Christmas cards!!! Linda K, Grant MI....thank you for the box of lovely cards and Any Hero letters and shipping donation!!! Kelly B, Apple Valley.....thank you for the cards and the drawings done by the kids. Your shipping help is appreciated! Rebecca P., Virginia Beach, VA - Thank you for the great package of cards today - your designs are always so wonderful for our heroes! Sheryl D, The Woodlands TX....thank you for another wonderful box of cards!! Love them! Mary R, Apache Junction, AZ - thanks so much for all the awesome cards---especially the great ones for our heroes' kids! Great job! Sandy F, Irvine CA - wow! It's truly been the holidays at your house...thanks for sharing the festivities with our heroes! Lisa F, Plover WI....thank you for the cute Halloween cards!!! Your shipping help is appreciated! Susan S, Grove City OH.....thank you for the wonderful cards and generous donation for shipping!!! Lauren L, Plainfield IL....WOW! What a large box of cards!! Thank you for all the assorted themes, The cards are beautiful! Debby P, Buffalo MO......another box of beautiful cards! THANKS! Your donation is much appreciated as well! Shirley F, Defiance MO.....thank you for the wonderful cards!!! Sharla V, Topeka KS......Thank you for the wonderful cards! Love them! Karen P, Fairfax VA.....thank you for the lovely cards. Beautiful!! Your shipping help is appreciated! Kay C, Minnetonka MN....thank you for the lovely cards. Joy O, Carmel IN...thank you for the beautiful cards! We appreciate your shipping assistance! Lori N, Jefferson City MO.....thank you for the wonderful cards and continued support! Karen and Mainstreet Church of Christ, Oakland Park FL......thank you for the Any Hero letters. They will bring smiles to lots of faces! Karen G, Oakland Park FL....what a wonderful package of Christmas cards!!! Love them! Sandi M, Fremont CA.....thank you for the wonderful package of beautiful cards and Any Hero letters!!! Your shipping help is appreciated too! Leah C, St Paul MN.....thank you for the wonderful box full of cards. Beautiful!! Sharon M, The Colony TX.....a second package from you!! Thank you...both packages of cards are wonderful! Sue A, Rockford IL.....what a wonderful box of cards and Any Hero letters. THANK YOU! Jayne R-E, Forston GA......thank you for the wonderful box of cards. They are beautiful!!! Pam J, Houghton Lake MI....awesome Christmas and love themed cards!!! Thank you! Stephanie G. and Robin H., New York, NY - Thanks for the great package of holiday (and other!) cards for our heroes! Shipping funds are always appreciated too - thank you! Linda K, Indianapolis IN.....thank you for the box of wonderful cards!!! Love them. Carrie B, Topeka KS.....WOW! What stunning cards! Thank you! Cindy B, Dearborn Heights MN...what a lovely assortment of cards! Thank you so much. I also appreciate the extra envelopes and shipping donation you sent! Melanie P and Daisy Troop 1324, Hurst TX......thank you so much for the wonderful Any Hero notes! Great Job. Katie M, Tulsa OK...thank you for the very pretty cards you sent in. Sarah H, Tulsa OK.......the cards you sent are beautiful...THANK YOU! Your shipping donation is much appreciated too!! Cecilia S., Raleigh, NC - Your box was overflowing with wonderful cards, thank you so much for supporting our heroes! To our anonymous donor in Quincy MI, thanks soooo much for the cards! Rebecca S, Munster IN......your cards are beautiful. Thank you!! Your shipping help is appreciated! Fowler and Friends, LaGrange IL.......thank you ladies for the wonderful cards and gift for shipping!!!!! Donna K, Gainesville MO....what a wonderful box of cards! Thank you so much for all the cards and Any Hero letters! Your shipping help is appreciated! Elaine L, Freer TX.....thank you for the beautiful cards and the Any Hero notes! Your shipping help is appreciated! Mrs Peter S, Glen Haven CO.......thank you for the beautiful cards!!! Karen L, Glen Haven CO......thank you for the beautiful cards! Suzanne H, Buffalo OK.....thank you for the package of cards. They are beautiful! Also, thank you for being a proud parent of a Marine!!! Joan J, Tucson AZ.....Thank you for the BEAUTIFUL cards!!!!! Patricia A, Tulsa OK....what a great box of cards! Thank you!! Kaitlin F. and the Mount Sinai Hospital, New York, NY - Thank you for the wonderful cards for our heroes! Linda M, Marietta GA.....WOW! This box of cards is awesome! THANK YOU! Celia C, Kerrville TX.....thank you for the wonderful box of cards and Any Hero letters! Much appreciated! Barbara B, Lakewood CO....beautiful cards!!! THANK YOU! Angela H, Wayne MI......What a great first box of cards!! BEAUTIFUL!!! Sharon T., Ijamsville, MD - Thank you so much for your wonderful package of cards - they are so clever! Pat Q., Bethel Park, PA - Amazing box of cards from you today, thank you so much - and for the shipping funds also! YOU are wonderful! Shari R, Vancouver WA, your halloween cards are delightfully spooky---thanks for making them part of your 25+2 challenge! Los Gatos Elks, San Jose CA - WOW! Your cards get better each and every time, thanks! The AnyHero cards are wonderful too...Merry Christmas! Karen G, Oakland Park, FL, it's so great to see your cards in person - they're wonderful, thank you! Tara C and the Murdock Movie Madness - thank you for doing a service project for our heroes at your family reunion! What a great idea...and our heroes will be blessed! The AnyHero cards are an absolute treasure! Encourage one specific hero with a note of thanks, get well, and encouragement! A friend of CFH would like us to help give her wounded marine, Ben, some encouragement in his recovery; his unit sustained several losses in the attack, and Ben was seriously injured. He's being a typical hero and doesn't want "the attention" (they all seem to deny being heroes!) but she'd love for him to be flooded with notes from across the USA! Sign up to represent YOUR state by leaving a comment on this post! We can take multiples of course for a state, but we'd like to see if we can get cards from all over. 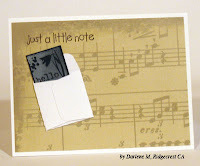 Write a note inside — positive and uplifting, thank you, get well wishes. (no sympathy for his unit's losses, please). Mail it to any shipper's address — they'll pack them all up and get them to Ben at the hospital! You can include it in one of your card shipments (be sure it's marked well so we don't miss it), or send it by itself (you can send it in a regular envelope rather than an envelope-inside-an-envelope). Deadline — we'll send them weekly as they arrive, but please try to get it done by Sept 30th or so...otherwise you know you're going to forget. And if you'd like, post a link to your card below so we can all go see! What’s your favorite kind of card to make? "just because" or "love you" You can never go wrong with telling someone they mean a lot to you. Do you have a special technique you love to use? I'm crazy lately about the scrap strip I learned at Summerhaven (Stamphaven.com) and I'm just getting started with all the stamping techniques. I usually do paper piecing or use my punches. What motivates you to make cards for heroes? to show appreciation to those doing an often thankless but highly dangerous job. Freedom isn't free and it takes the families as well as the soldiers to make the armed forces work. Bloghop is a-coming...are you ready? Have YOU made a card for it yet? Publish your blogpost by THIS THURSDAY at midnight PST and email the direct link to bloghop@cardsforheroes.org - include a link to http://cardsforheroes.org/bloghop and a little about why YOU participate! Via email you'll receive the url for the blog that follows you on Friday - update your blogpost with a link to the next stop by Saturday am. Hop hop hop around this weekend!! 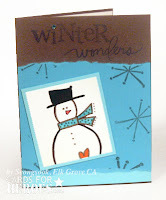 Get inspired to make more Christmas cards! If you try this, please let Tami know - her blog post with the tutorial is here. If you have questions, feel free to leave a comment there to ask! For those who are "fans" of our Facebook fan page, you probably saw the casual video that showed up late last night! Hoping to create a few more of these from time to time...they're not high quality at all, they're just quick little vids using my pocket camera, but it might help show a little more behind-the-scenes operations at CFH. If there's something you'd like to know about CFH, how we sort and pack boxes, or have other ideas for our quick casual videos, be sure to let us know! And by the way, all our shippers are on Facebook - if you're a FB user and would prefer to drop the shipper a line there rather than seek out their email, feel free to look for them. Note that we're using our personal email addresses for our FB profiles, so trying to friend us by looking for our @CFH emails won't work. Send the shipper an email if you need help locating them - and include a message when you send a friend request so we know who you are! You're invited to a card drive!